It's that time again, folks! 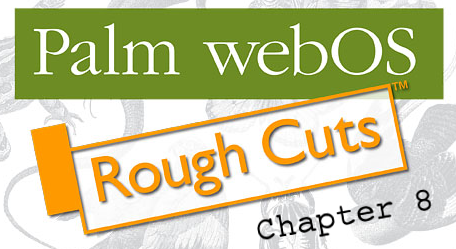 Chapter 8 of Mitch Allen's Palm webOS Rough Cuts has just surfaced. This chapter covers system and cloud services, which include a wide range of things such as alarms, sounds, power management and location services, to name a few. Both Contacts and Calendar will allow applications to add information that will get merged into an integrated view. They don't allow applications to read, delete or update any data that wasn't created by the same application. Essentially this means we won't be seeing any today-screen apps anytime soon. While a well-done today-screen app can be very handy, the above restriction does make some sense security-wise, especially if Palm wants to try to sell the device to business professionals. That being said, another reason they may have done this does come to mind. It's very possible Palm wants users to only be able to use the built-in Calendar and Contacts applications to get people used to them and like them. See, if Palm removes the restriction (even partially to just allow reading the data) then developers would be able to make replacement contacts and calendar apps (perhaps DateBk for webOS) and still be able to import synergy via the built-in calendar. Palm wouldn't want that kind of competition, especially while their own apps are still fresh and new. We do hope Palm will eventually update the SDK to allow such things, but considering it was in chapter 7 of the book, this restriction will probably make it to the first public SDK release. Not that its a completely bad thing. Increased security during a new OS's release definitely has it's advantage and it's not as if the built-in Calendar and Contact apps look bad. So far they look quite the contrary: beautifuly designed and extremely functional.